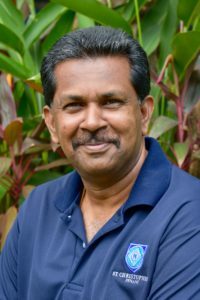 Ravi is from Penang, Malaysia and joined SCIPS in 1994. Prior to this, he was attached to local schools when he started his teaching in 1983. He obtained his teaching credential from Ipoh Teachers Training College, Perak. He has vast experience teaching children from the age 6 to 12. He specialised in teaching Bahasa Malaysia before taking on the responsibility to teach Maths for Year 2 and 3 in 2004. Currently he teaches Bahasa Malaysia from Year 1 to 6 and supports Maths for Year 5 and 4. 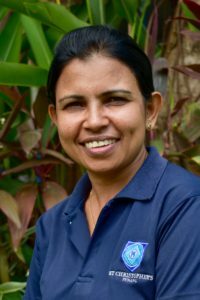 Sarasu is originally from Kedah, Malaysia. 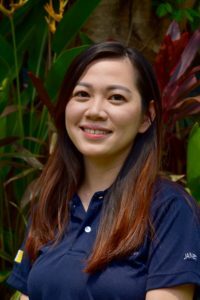 She has a Bachelor Degree of Arts in English and Literature from University of Malaya and a Post Graduate Certificate in Education (PGCE) from University of Sunderland, UK. She has been teaching for 14 years in SCIPS, having taught in Reception, Year 1 and Year 2. Currently she teaches Bahasa from Year 2 to Year 6 and Maths to Year 3. Sarasu is married to Raja and has two children, Gisshara and Nidhis. Janet is from Malaysia and has a Bachelor of Arts degree in Music from University Sains Malaysia (USM). Upon completion of her studies, she taught Music and Mandarin in Penang. In 2011, Janet completed her Master of Arts (Pedagogy and Performance) at USM. During her studies, she worked as a piano Instructor. She has been teaching the piano for seven years and she is also a classically-trained pianist. 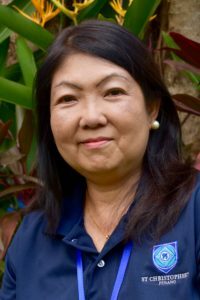 Janet started teaching at St. Christopher’s in September 2015 as a Mandarin teacher. Catherine is Malaysian and always knew she wanted to have a career in teaching. Her interest in teaching has enabled her to work with a wide range of age groups. Obtaining a diploma in TESOL from the London Teacher Training College meant that she was able to work more closely with non-English speakers in teaching them English as an additional language. It is this aspect that she now enjoys. Catherine has been teaching for twenty-two years and is also a classically-trained pianist. She is still actively involved in making music, whether with friends or other professional musicians. She is a holder of the Licentiate of the Royal Schools of Music, London and a Fellow of the Trinity College of Music, London. Catherine has been an EAL teacher in St. Christopher’s since 2008. Sittra was born, raised and educated in Penang. 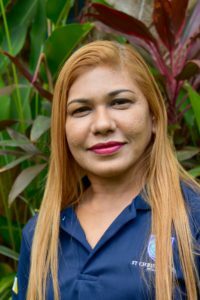 She has been teaching English, Maths and Malay Language to children ages 6 to 9 years old in private schools for the past 20 years. In her early years she took a two year course to get her teaching certificate and later received her Primary Combination teaching diploma from London Montessori. She has also completed her TESOL to enhance her skills as she loves educating and nurturing young talents. She has attended many workshops on education to further improve her teaching skills. 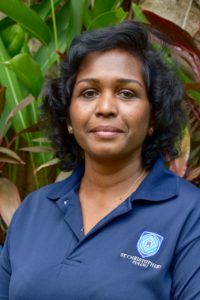 Sittra was appointed as EAL teacher for KS1 and has served for 5 years in St. Christopher’s International Primary School, Penang. 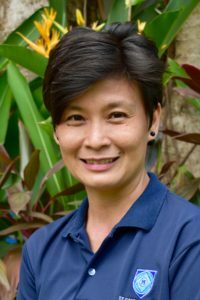 Joanne was born in Penang and has a Bachelor’s Degree in Human Relations from Golden Gate University, San Francisco, California. 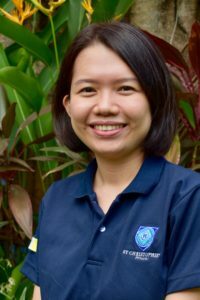 She has been working at SCIPS for the past 13 years, 10 years of which have been in the Early Years department as a class teacher and 1 year supporting the EAL and SEN program. This is her third year as a teacher in Learning Support, working alongside the Infant and Junior teachers. She is married and has 2 lovely boys, Kai Ru 12 and Kai Ji 8. Sabine is from Germany. After finishing University she taught many years in German primary schools. She has a passion for teaching and travelling, speaks 4 languages and visited more than 20 different countries in her life. 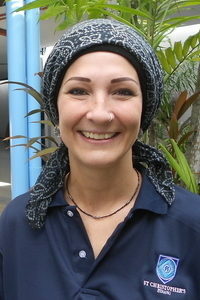 Now she enjoys being in Malaysia and starting teaching children from all over the world at SCIPS. She loves the cultural variety in Penang, the great food and exploring the island with her little family which for them is a perfect place to stay. Sharifa is from Penang, Malaysia and has a Bachelor Degree in Business/ Economics from Northern Illinois University in Dekalb, Illinois United States of America. During her studies, she worked on the campus library, where she developed her love for books and libraries. She was also an active member of the Dance Theatre, using her training in classical ballet. Sharifa has also dabbled in journalism reporting for ‘The Northern Star.’ Upon her return to Malaysia she worked in the corporate sector as a sales and marketing executive for a prominent jewelry chain. She is currently working as the Librarian at St. Christopher”s International Primary School. Jonathan is from the United Kingdom and has a Bachelors degree in English Literature/Language and Theology from The University of Birmingham. After a year spent travelling in Canada, America and Mexico, Jonathan started working in a special needs secondary school as a teaching assistant. 2 years later, Jonathan completed his Post Graduate Certificate in Education specialising in Literacy. Following that, Jonathan worked in Surrey as a teacher of a Year 5/6 mixed class for 2 years, where he was also the school sports coordinator. After 2 years working as a Year 6 teacher in Dubai, where he met the future Mrs Abel, Jonathan settled in Penang. Jonathan is married to Kirsty, who is a former teacher at SCIPS, and they have three daughters, named Tamara, Kerenza and Morwenna. David Evans originates from Anglesey in North Wales where he was a very keen sportsman. David participated in many sports most of all rugby and represented his district for many years. David arrived in Penang in January 2013 and enjoyed volunteering to help with the P.E departments after school activity programs. Following this, David secured a position within the P.E department and he has now been a dedicated member of the P.E team for five years. He has enjoyed teaching P.E within SCIPS and has found great success with the inter school sporting competitions. 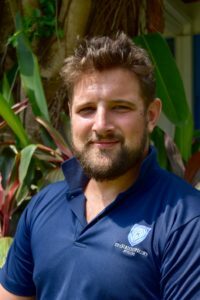 During his time here David has also completed his PGCEI with Keele University in the United Kingdom, and he married Miss Sarah (also from the P.E department). They are both overjoyed to welcome little John Cernyw (J.C) into the world. Sarah Doran is originally from Anglesey in North Wales were she spent most of her time in the pool training with the City of Bangor Swim squad. She was a dedicated swimmer and has represented her club, her county and her country in this discipline. She also went on to play water polo and was talent spotted for the British Olympic team. 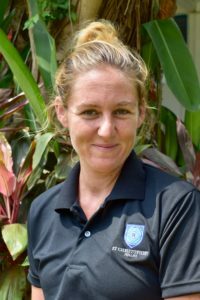 Sarah completed a Degree in Sport Science and Physical Education at Bangor University before moving out to Penang and joining the PE Department at St Christopher’s. Yi Yiing was born and raised in Penang, Malaysia. She started piano lessons when she was five and she has had music in her life ever since then. She graduated with honours and holds a Master in Early Childhood Education from University Science Malaysia, and a Bachelor degree in Music Performance from University Putra Malaysia. She loves interacting with young children and has a passion for teaching. Besides music, she loves spending time with family and her daughters, Chloe and Joie. Jonathan is originally from Chester in the UK and has a Bachelor of Arts degree in Music from Nottingham University as well as a PGCE from St Martin’s College, Ambleside. He enjoyed being a class teacher for many years, teaching Years 1 to 6 in Suffolk, UK and then at The British School, Kathmandu in Nepal where he met his wife Bina. 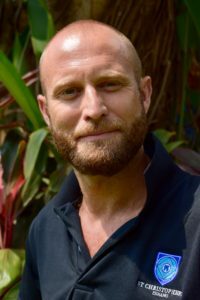 Whilst in Kathmandu, Jonathan was able to become what he had always wanted to be, a music teacher, and has enjoyed sharing his passion for music with children of all ages, first during his 9 years in Nepal then for the last 3 years at the British International School, Ho Chi Minh City in Vietnam. He loves being involved with concerts, productions and music festivals and enjoys opportunities to perform himself – either playing flute or singing in a choir. 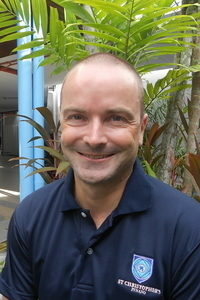 Jonathan is looking forward to working on the beautiful island of Penang and getting to know the SCIPS community.